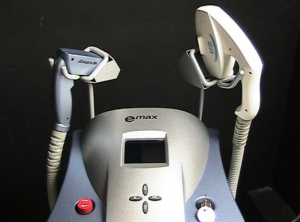 This Syneron eMax Laser system is in excellent condition as it has never been used – still in the box. While there may not be a cosmetic workstation that can perform every single cosmetic procedure being offered today, the Syneron eMax laser machine comes very close. Powered by Syneron’s elos technology that harnesses the power of radio frequency and laser or light optical energy, the Syneron eMax laser machine can pretty much do it all – and it can do it faster and more effectively than comparable systems. Safety is an important issue to both cosmetic service providers and patients, and that’s part of what makes the Syneron eMax laser system so popular. This model has achieved exceptional results in this area because the elos technology uses less energy than traditional methods, which means greater patient comfort and satisfaction. The Syneron eMax laser machine is the only system that most cosmetic businesses will need, but that doesn’t mean you should pay too much for it. At SunrayLaser.com, we can offer a used Syneron eMax laser machine for sale at the lowest price possible, often as much as 60% off the original retail price. Not only do we strive to provide the lowest price on a pre-owned Syneron eMax laser system, but we stand behind what we sell with a 100% satisfaction guarantee. We also have a professional customer service team ready to answer any of your questions or provide a Syneron eMax laser machine price quote with no obligation.